What does that mean? August is when the Hamptons explodes. The traffic, the parties, the celebutants are all here and every business is operating at full tilt. But at b+f April is our August – because we have to help lots of businesses get ready for “THEM.” That means we’ve been super busy but don’t worry – we’ve been getting to the beach before it gets too crowded. If you want to reach folks in the fabulous Hamptons, we know how to get their attention. email us! Race Lane – We did the logo and holding page for this new restaurant at 31 Race Lane in East Hampton, owned by Jay Plumeri and Rowaida Younes. The restaurant promises a fresh twist on delicious classics – and the renovated space with beach hues and a brighter feel looks great. Hop on over. 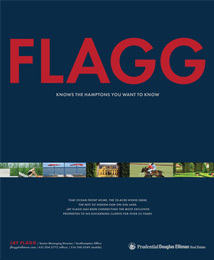 Jay Flagg, Senior Managing Director of Prudential Douglas Elliman, has a new print campaign breaking in Hamptons Magazine. He’s been in the business for over 25 years and knows where the hidden gems of the Hamptons lie. 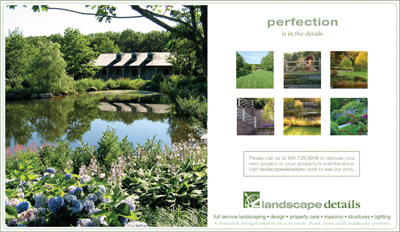 Landscape Details has new advertising PERFECTION IS IN THE DETAILS AD HERE, and a new website www.landscapedetailsinc.com. Michael Derrig’s aesthetic is unparalleled out here, which is why he and his crew have been up before dawn every day for months. ELM – Ecological Landscape Management has a new logo and stationery. Website is coming. This company takes organic to level 3.0! 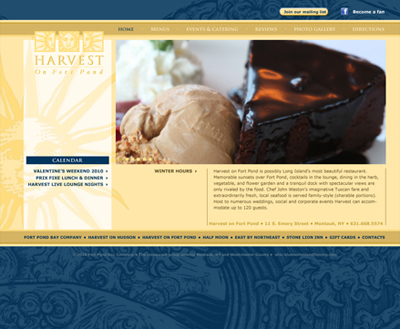 Fort Pond Bay Company – the restaurant/hospitality holding company that owns Harvest, ENE, Harvest-On-Hudson, Half Moon and Stone Lion Inn has 5 new websites launching soon. Southampton Hospital is rolling out new and improved logos. They just won a patient safety award that no hospital in NYC won. And, the new Emergency Room opens in June. The Ellen Hermanson Breast Center has a new (pro bono) brochure PDF thanks to us and www.francinefleischer.com. Old World Mouldings has a new website www.oldworldmouldings.com. What else is new and worth checking out? Navy Beach is a great new addition to the Montauk Dining scene, and the new chef at the Yacht Club rocks. Outeast, a new gallery space in Montauk opened right next to Duryea’s. Pamela Eldridge is the new associate publisher at HC&G. Kendal Cranston is the new editor! www.yourchitect.com is launching in the Hamptons and worth checking out! Previous: How to build your Brand in the Hamptons! Next: They’re here!!!! And we don’t want them to go anywhere else! That “Race Lane” logo is genius! So clever, cute and appropriate for East Hampton! Great work ladies. It’s been a busy spring for you. Congrats!!!! PS. I love the Ellen Hermanson brochure cover.